Processed and packed the online orders, bit of an increase - perhaps xmas shopping? Managed to shelve all the Anime purchased yesterday, along with another box of various books from today. Shelved the comics arrived today (late due to the holiday), and sent in the Diamond Comics orders. Purchased some sealed VHS & DVD Anime. Processed & shelved a box of rare signed & kids books. Shelved some moderate collectables, and more 45 rpm singles and EP albums. Small Business Saturday was rather small. Purchased 2 collections of mostly fiction stock, some tpbs, some black history. Processed a box of rare & signed books, shelved them all, most of them put online. Shelved a half shelf of moderate collectables. Shelved 4 large stacks of books, hardcover and large softcovers, lots of modern lit fiction, history, ancient history, crime, cookbooks, self help, relationships, metaphysical, classics, mythology, more. Cleaned up the donation from the other day. Straightened up behind the counter. We'll be closing at 3:00 on Thursday, for Thanksgiving. Another phone call where they still saw the old address online, so spent the morning trying to get websites to update our info, some of whom we contacted six months ago after the move, but still had the wrong info. Sorted a donation of magazines and old books. Shelved some late 1800's history, poetry, and philosophy. Shelved some movies, (including a few best of saturday night live tapes). Didn't buy a collection of manga. Heard those laptop theives were down the street at the new Antique/Gift shop. Fixed and printed up new Gift Certificates for the new location. Bah, car battery died, $125 via AAA to replace. Eh, least it was done quick and it's not like could get anywhere else to do anything about it. Processed and packed the online orders. Fixed some online listings. Shelved a handfull of non-fiction. 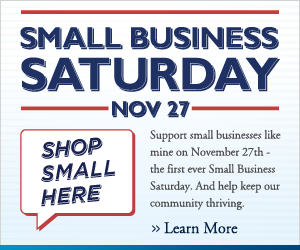 Sent out email coupons for Black Friday & Small Business Saturday. Packed up 6 boxes for wholesale. Learn how you can get $25 back from American Express. 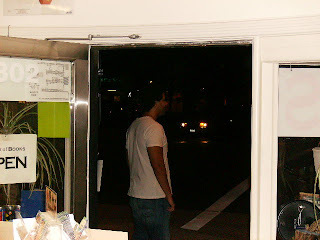 Sign up for our email list and get a $5.00 coupon to use on Black Friday November 26, 2010. Processed and packed the online orders eventually. Shelved the last of the 45 rpm record singles. Sorted 3 boxes of signed comic books. Shelved some 45s singles vinyl records. Shelved 2 boxes of inexpensive (under $7) books of good subjects, ancient history, fiction, cookbooks, more. Shelved some CDs and 45s. Shelved a 1/4 shelf of moderate to highly collectable books. New comics/graphic novels/magazines arrived & shelved. Shelved a box of kids books. Off to see HP 7.1 midnight showing. Changed out the spinner rack in the front which had previously held mystery mmpbs to be vintage mmpbs. No one much went over to that one, and some of the old vintage paperback covers look really great, so having them face out on the spinner instead of spine out on the shelf might work better. Puttered around fixing and cleaning things. Shelved a box on inexpensive books (all under $7), some fiction, ancient history, history, young adult, cookbooks, and mythology. Listed 2 boxes of cheap stuff. Well we horribly offended this lady because we didn't want to buy her great books. We kept telling her we weren't trying to make a judgment on the quality of the writing (and we're sure Danielle Steel is a fine writer she's certainly sold millions of books) we just couldn't use them. But she was quite outraged that we wouldn't take them, ah well. We have plenty of Danielle Steel books already - we'd be glad to sell them, but we don't need more copies if what we have aren't selling. Processed and packed the online orders, and a couple of boxes for wholesale. Got the new credit card machine set up, at least we think so, after having to turn them down all week, no one wanted to use a card today. The new machine finally arrived. It's all set up and looks to be working fine. We can now also accept debit cards directly instead of running them as credit. Pair of damn thieves stole the laptop yesterday. The woman distracted us with crazy questions (on retrospect she was acting a bit nervous, and kept trying to get our attention to the opposite direction of the door), while the guy with the foul mouth must have reached over the counter, swiped it, and left. Didn't notice at the time, but it was there before them, and they were the last ones in the shop and it's not there this morning. Most annoying, even if we never did get it to network, and don't think there was anything personal on it. Shelved 4 stacks of non-fiction, history, cookbooks, humor etc. Had to put some cookbooks on the $1.00 carts to make room. Small donation of textbooks and young adult books. Did some data recovery on the computer. Purchased some How-to Art books, and some role playing game books. We shelved quite a few signed books, mostly behind the counter. Purchased some CD's (and shelved them already) and some VHS and a few books. Some @#@#$% broken into the public storage unit again, had to go put on another new lock. Shelved a few cookbooks, and some other large hardcovers. Shelved the rare cookbooks from the purchase the other day. Purchased more VHS, and put a pile on the $1.00 cart. Answered emails & added pictures online. Purchased some LP's and textbooks, and kids books, and VHS. We cannot accept credit cards for the time being. Hopefully it will be fixed soon. Fixed up the comics a bit. Put more VHS and some kids non-fiction on the $1.00 carts. Paid the bills, did some of the accounting. Purchased 2 boxes of VHS and shelved most of them. Purchased a couple art books. $@#^#$%!#@$ computer. Spent most of the day fixing it, and it sort of works again. Still managed to process and pack the online orders. The kxcd book is in stock! Marked down the audio-books, lots of tapes out on the $1.00 carts now, and the rest down to at least $3.95. Purchased and shelved 2 boxes of Signed books, lots of Mystery Hardcover, and SF. Shelved a stack of collectable books. The Art of Books was down for around a half hour. Purchased 3 boxes of rare books. Shelved 3 boxes of rare books, mostly behind the counter. Cleaned up in preparation for First Friday. Photo-display out front for First Friday. Photo of the Photographer getting his photo taken in front of his Photos. Free books for First Friday. Installed new backup drive & started backups. Purchased some textbooks, and some science books. Packed a couple of boxes for wholesale. Verizon phone book ads for Dec 2010. Shelved the rest of the comic books, now fully organized with easy access! Sent in the Diamond order. Shelved a couple of stacks of recent massmarket paperbacks on the racks. Processed & packed the online orders, Post-woman was too busy to pickup today. Re-shelved all the stuff we took to Long Beach Comic-Con 2.